Mitchell-Innes & Nash is pleased to announce the public commission by Sir Anthony Caro at the Eglise Saint-Jean de Baptiste of Bourbourg and a major retrospective of the Artist's work in France presented simultaneously at the museums of Calais, Dunkirk and Gravelines. 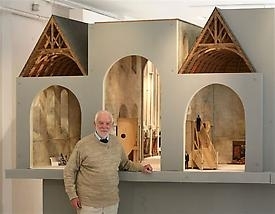 Over a period of several years, Sir Anthony Caro has been working on a major series of sculptures and architectural features to form part of the restoration of a chapel at Bourbourg in Northern France, about 12 miles east of Calais. The 'Chapel of Light' is situated in the choir of the Church of St Jean Baptiste. During World War II, a damaged English aircraft crash-landed on the roof of the church in order to avoid the houses in the town, and set it on fire. The church itself was restored, but the choir was separated by a wall from the body of the church and left in ruins until ten years ago. Caro was commissioned by the French Ministry for Culture and Communication to make a sculptural installation that would bring new life to the choir. Specifically for the project he has designed and built two huge internal oak towers each about 18 feet high. These towers are to be used for musical performances and allow vertical exploration of the church space. Caro has also made a concrete baptismal font and a spectacular series of steel, wood and terracotta sculptures to fill a series of niches in the walls of the apex to the choir. Various other sculptures complete the east and west naves, linked through a doorway to a large exterior sculpture in corten steel. The sculptures follow the themes of The Creation (relating to the baptismal font) – culminating in Adam and Eve. Anthony Caro recognises that this monumental project is an exceptional opportunity for an artist. He stated, 'The light in the church is wonderful and it is such a privilege as an artist to be given a whole space to work with'. Not since Matisse's Chapel in Vence has another artist been given this opportunity. The Church will be inaugurated on Saturday 11 October 2008 during a weekend of events to include the openings of the three exhibitions in Calais, Dunkirk and Gravelines (see attached). A fully illustrated catalogue will be available at the inauguration. The project has been made possible through the kind financial support of : The ERDF (FEDER): The French State, Ministry of Culture and Communication: The Regional Council for the Nord - Pas de Calais: Dunkirk Coastal Area (Dunkerque Grand Littoral): Parliamentary allowance of the Member of the French Assembly M. DECOOL: The SIVOM of the Aa and others. 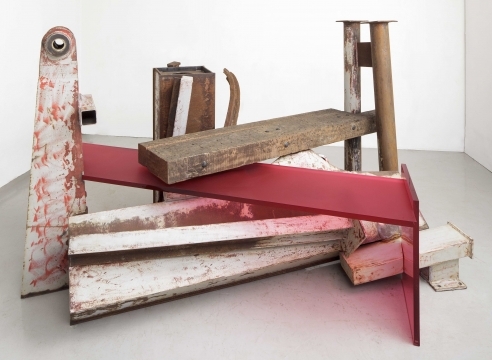 This major retrospective of works by Anthony Caro will be shown simultaneously in three museums in Calais, Dunkerque and Gravelines. Following an extensive survey exhibition of steel sculptures at Musee des Beaux-Arts in Angers (24 May – 21 September 2008) this exhibition will be formed in three parts: The Barbarians, Trojan War, and Kenwood sculptures at Calais, Sculptures in Steel (1960-2006) at Dunkerque and Paper Sculptures and 'dialogues with architecture' at Gravelines. They will allow the public complementary points of view into the work of the sculptor from 1960 until today. These joint exhibitions will include almost 100 works – the largest ever show of the artist's work. Twenty-eight sculptures will be displayed from three important figurative series: The Barbarians, The Trojan War, and the Kenwood Series. This show is a survey of Anthony Caro's later figurative works, incorporating large elements of ceramic and wood. The Trojan War series made in 1993-94 was Caro's first exploration into narrative sculpture taken from a mythological source. From the original series of 39 sculptures 13 will be shown depicting some of the mythological gods such as Achilles, Apollo and Aphrodite. The Barbarians was Caro's second major mythological sculpture – one complete installation of imposing horse-backed figures and a horse-drawn cart. The LAAC museum will show a selection of 15 abstract steel works dating from 1960 to 2006 along with Anthony Caro's first major 'architectural' sculpture 'Child's Tower Room'. The works in this exhibition were first shown in an important show at the Musée des Beaux-Arts d'Angers from the 24 May to the 21 September 2008. These works, of medium and large scale, give an insight to Caro's most important themes and sculptures – from early painted pieces to the recent galvanised sculpture 'Slow Passage'. They indicate Caro's relentless interest in architecture and spatial exploration. Built and designed during the 1970s, the museum is situated on a site which formerly housed allied gun batteries during the WWII. On show in Gravelines will be the most comprehensive display of Caro's Paper sculptures ever seen in one venue. 33 will be on show. The paper sculptures, started in New York in 1981 and continued in Japan in the early 1990s are on the edge of drawing and sculpture - exploiting Caro's lyricism. To create a dialogue with the architecture of the Powder Room in the Arsenal of Vauban's fortifications, the museum will also present a group of fifteen sculptures. Six Table Pieces, eight works from the series Arena (1995) and two from the Duccio series (1999-2000). Outside the museum the monumental steel work Cathedral (1988-1991) will be on show.